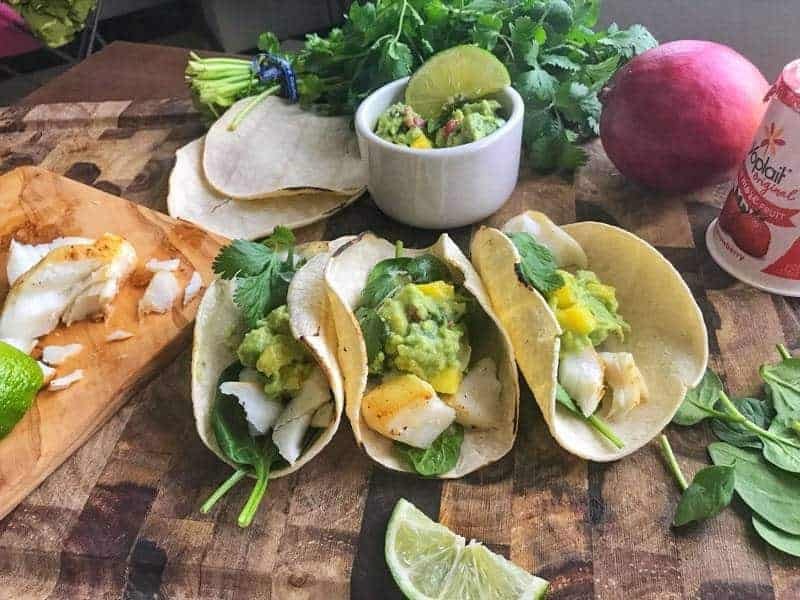 Baked fish tacos made with a mango guacamole. 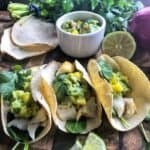 These cod fish tacos are simple to make and the creamy guacamole takes them to the next level of yumminess. Growing up, my mother would serve baked cod that we’d dunk in butter. I didn’t enjoy this meal very much. Looking back, I’m thankful my mother continued attempting to get me and my 3 siblings eating more fish, it’s certainly a food that we all can benefit from due to its high content of Omega-3 fatty acids. Omega 3’s are essential for brain health and some studies suggest they reduce the risk of heart disease. The 2015-2020 Dietary Guidelines for Americans recommends adults consume at least 8 ounces of seafood per week. Aim for two 4-ounce servings of fish each week. At my house, I eat plenty of fish each week, but my children (and husband) do not. It’s a goal of mine to work to improve this to a solid 4 ounces each week and go up from there. I have to start somewhere, right? Working towards this goal, I decided to try my hand at the very tasty —> fish tacos. 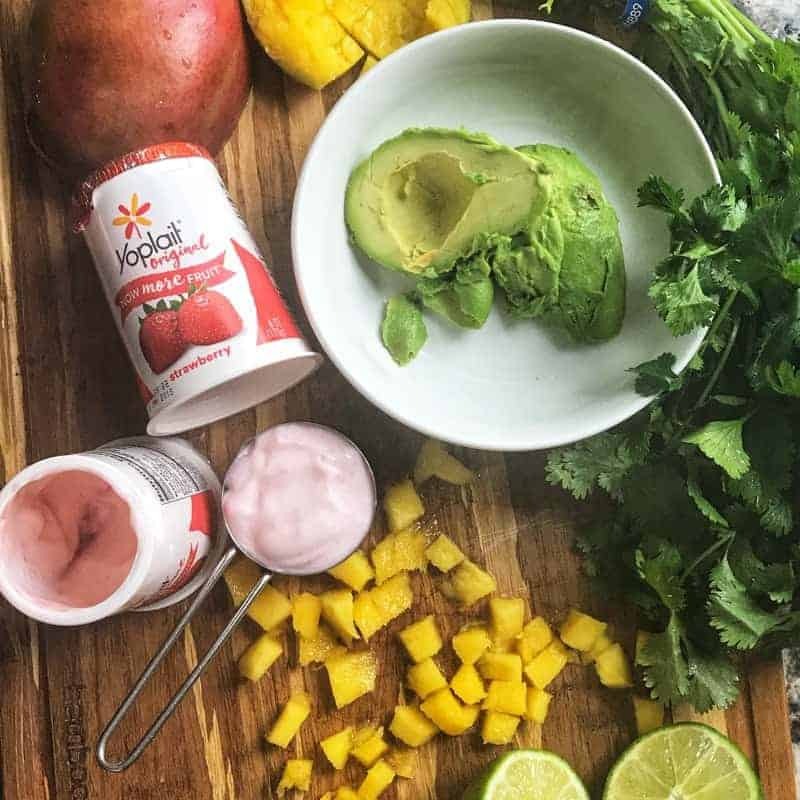 The tacos I’m sharing today are not just any fish tacos – they are a Baked Cod Fish Taco with yogurt guacamole – a delicious strawberry, mango, and cilantro lime yogurt sauce that is perfect for fish tacos. To make this sweet, yet savory, guacamole, start by mashing one avocado with the strawberry yogurt. 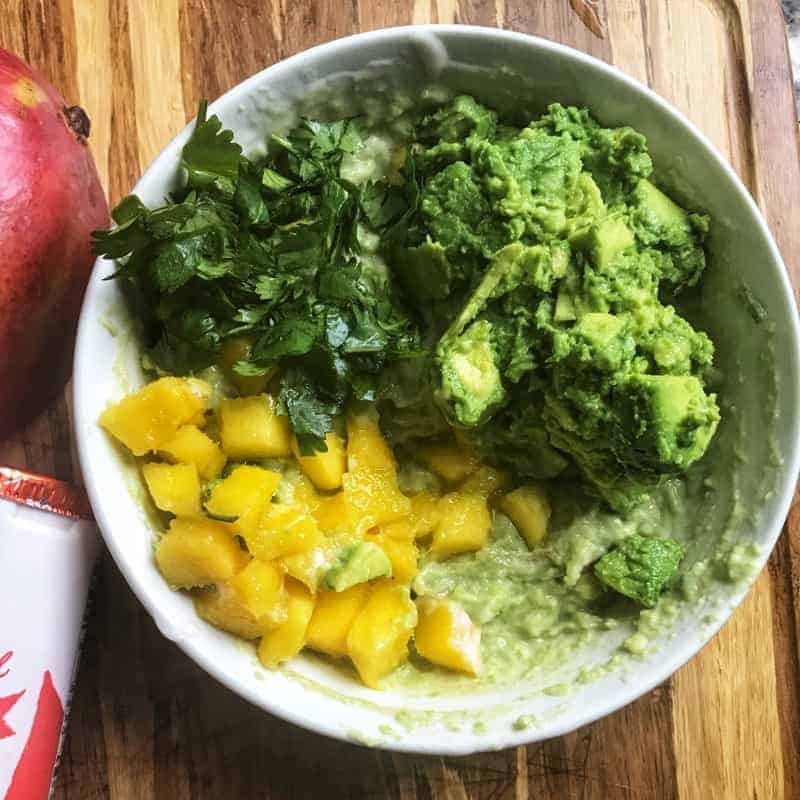 Add the mango, avocado chunks, cilantro, lime juice, and salt. Blend with a fork. 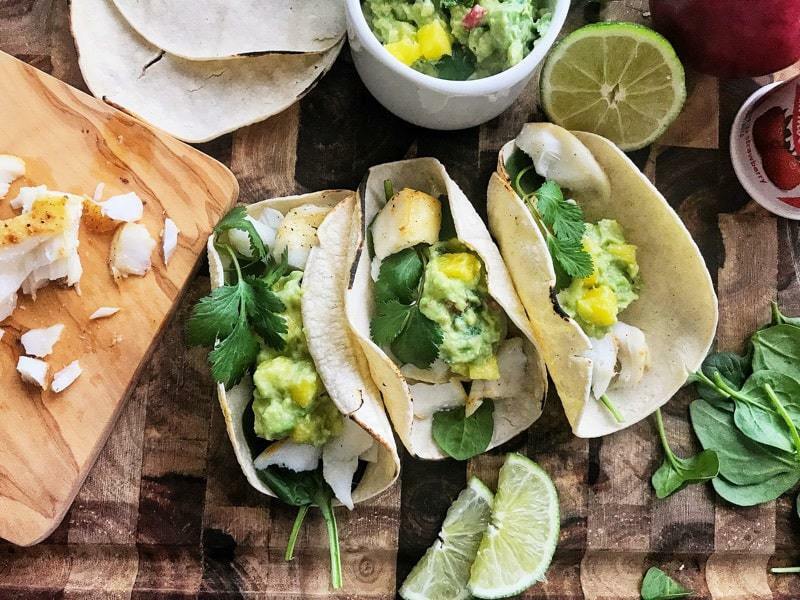 I made this easy fish taco recipe with Wild Pacific Cod, but you could use any white fish. Check out an easy method for broiling fish by CLICKING HERE. All that is left is assembling the tacos. Fish tacos are traditionally served with a slaw, but that would have pushed my family a bit too far. I settled for a spinach base, topped with baked cod, the guacamole, then drizzled with lime juice once served. 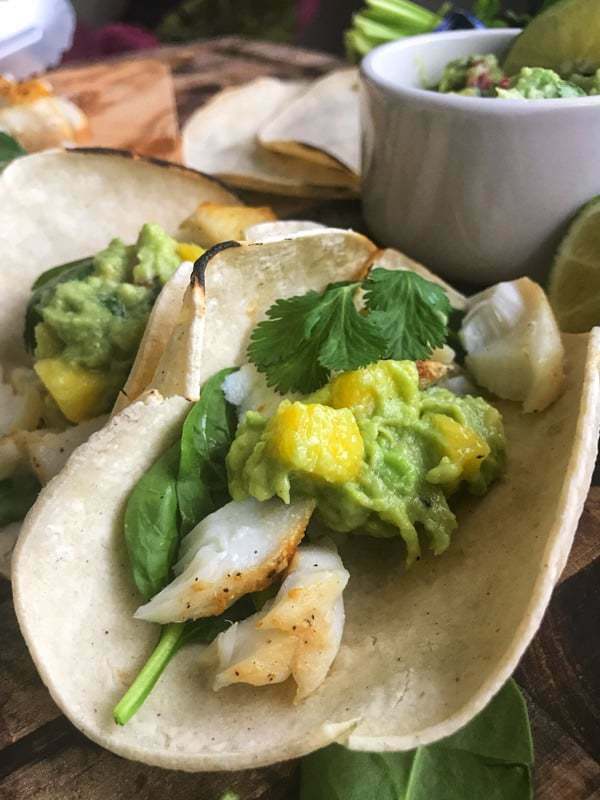 A simple baked cod fish taco recipe with a creamy mango guacamole sauce. Place fish fillets on to a baking sheet, season with olive oil, salt, and pepper. Place fish on the top rack of the oven. Cook for about 10 minutes, or until fish hits an internal temp of 145 degrees. Set aside. In a medium-sized mixing bowl, mash the whole avocado along with the yogurt. Add in the cubed avocado, mango, lime juice, salt, cilantro, and pepper to taste. Mix with fork. Place fish on the corn tortilla topped with guacamole. Serve immediately. Top with additional lime juice and cilantro if desired. For full instructions on broiling fish, check out the link in the post. Such a creative recipe! I love the story behind it too, especially because I grew up 1 mile from UCSD, in the house my parents still live in 🙂 I can not wait to try this! !